Flying in to Falalop. The small airstrip runs the width of the island at its widest point. Asor, behind, marks the beginning of the northern reef. "To get to Ulithi, first you would fly in from outside of Micronesia and get to Guam," Mariano explains. "From Guam, if you decide to come to Yap, you’ll have to take the Continental commercial airline, which comes three times a week." "After you get to Yap, then if you plan to come out here to Ulithi, then you’ll have to make arrangements with the Chief of Ulithi. If you’re coming out here on your own—lets say you just want to come out here to Ulithi and check out the place and see the islands—then you’ll have to make arrangements with the Chief before you can come out here. "That would be Chief Ignacio Hapthey, who resides in Yap. He is the chairman of the Council of Tamwool, or the Council of Chiefs. 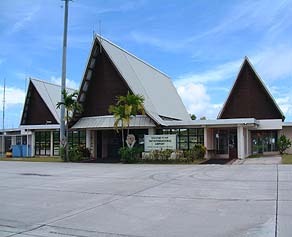 There are two councils in Yap. One is called the Council of Piiluung. Piiluung is the term for ‘chief’ in Yapese. And one is called the Council of Tamwool. Tamwool is the Ulithian term for 'chiefs.' The Council of Tamwool meets twice a year, and the Chairman of this Council, Chief Ignacio Hapthey, resides in Yap." Flying into Yap. 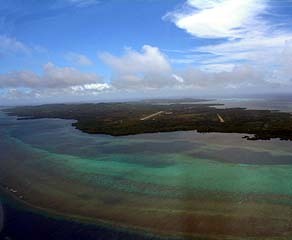 Note the wide reef platform, and two runways. The runway on the right is the old Japanese runway, no longer usable. "The other Chiefs of each island, each island has a chief to be represented in this council. Not only the island of Ulithi; it goes all the way to the very last island of Yap state, which is Satawal. "And so let’s say you meet with this chief, you ask permission to come out here, if you are planning to come and stay on Falalop, where this resort is located, then after talking with the Chief you can make arrangement with the hotel here. "But if you plan to go out and, let's say, you plan to come out and go to Mogmog, now when you talk to the chief, the chief will notify the people of Mogmog." "If you come out to Ulithi by plane, you take the Pacific Missionary Aviation (PMA) plane, which can only take nine people." 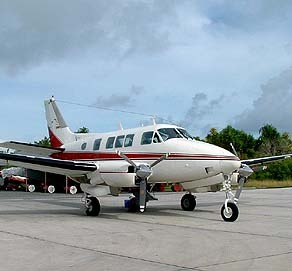 The PMA plane flies to Ulithi on Mondays and Fridays, though you can charter it for additional flights. It takes about 45 minutes to get to Ulithi from Yap. "If your plan was to visit Mogmog, then by the time you land here, a Mogmog boat should be waiting for you here to take you to Mogmog island. And if you’re coming out here, lets say for work or for a conference out here for education, usually the Education office in Yap notifies the educational people out here in Ulithi. "So if you come privately you’ll have to talk with the chief in Yap. When you get here, you still have to visit the chiefs here to tell them the purpose of your visit." One of the planes operated by Pacific Missionary Aviation. PMA was founded in 1975 to aid in missionary work and to provide transportation of doctors and patients to and from the more remote islands of Micronesia. The Field Trip Ship approaches Falalop. "If you plan to come out by boat, which is only the one Field Trip Ship that we have in Yap, then by the time you get to Ulithi the people of Mogmog should know you’re coming to Mogmog, that you’re a visitor. "The field trip ship supposedly making two trips each month. And that doesn’t always happen because of the delays. 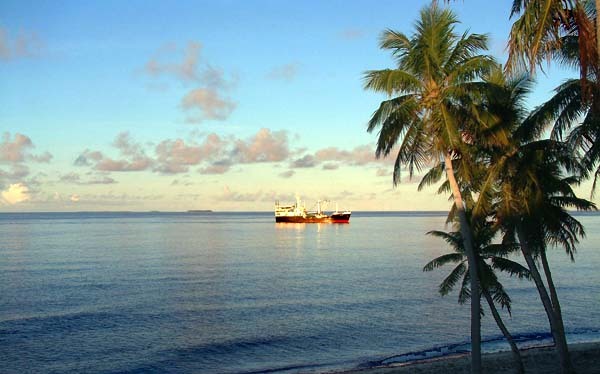 The ship, once it leaves Yap, it comes out here to Ulithi—lets say it takes overnight to leave Yap and get to Ulithi, so if you leave Yap in the evening, by morning you reach Ulithi. And leaving Ulithi, from Ulithi to Fais, which is about 40 miles out, that’s about four hours’ ride on that boat. "From Fais to the next island, Eauripik, that’s the longest distance for this field trip ship to take, because it takes 48 hours from Fais to get to Eauripik. Then they will take perhaps half day to the next island, and overnight to the next, and on and on, until you reach the last island. "So, we can say that there is a bigger gap between Fais, which is closest to here, and Eauripik which is closer to Woleai. That’s the longest distance this field trip ship takes. 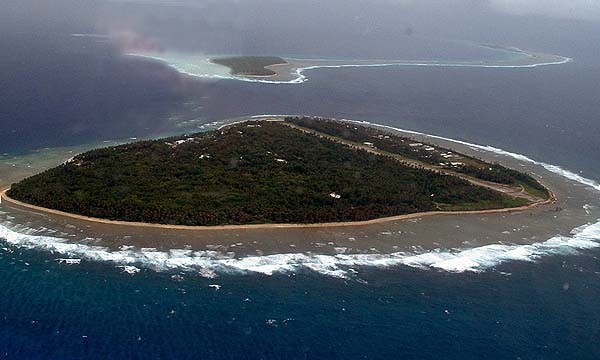 So Ulithi is kind of close to Yap, but much further than the rest of the islands in Yap State." The new airport building on Falalop. Approximate travel times by motorboat. 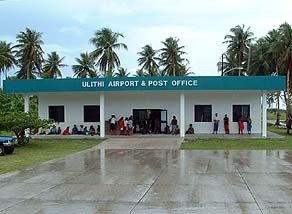 "Once you are in Ulithi, traveling in Ulithi is not that difficult. Even during rough weather people still travel. Falalop to Asor is only about ten minutes by motorboat, and it’s about twenty-five, thirty minutes from Falalop to Mogmog. "Falalop to Fedraey, it takes about an hour, slightly less. This is traveling in good weather. To get to Fedraey from Falalop, we pass Maas, Maas is on our right, so we cross in the middle of that submerged reef which extends from Asor to Fedraey. We have to cross to the inside of the lagoon, into calmer waters. And then we just ride past Mangeyang, we passed L’ool’ang, and then we get to Fedraey. Now you are ready to arrive in Ulithi Village.